I’m not shy to talk about how much I love the popular content management system and web application framework, Drupal. What’s more interesting to me lately, however, is how well suited it is to creating a custom lifestream site. Third party services with shiny widgets and badges are nice, but I wanted to be the one holding onto my own data and being able to do whatever I wanted with it. At the core of lifestreaming apps is the functionality to read and redisplay RSS feeds from various online services. Drupal core comes with the ability to read external RSS feeds, except it is only intended for display of current feed content, since it does not actually save the RSS content on-site. However, if you add a couple of contributed modules, you get an amazingly robust and flexible RSS parser that then has the power of Drupal behind it in order to manipulate and display the content. Following the instructions for either Leech or FeedAPI, configure your feeds to have the content pulled to your Drupal website. At this point, you’ll probably end up with a dump of content on your site without a heck of a lot of organization to it. This is where Views comes in. If you’ve ever used Drupal before, you probably discovered pretty quickly that Views is a must-have for almost any site. Think of it like a query builder that allows you to expose and filter your content any which way. Using this module, you can set up views pages to, say, display a table of the latest songs you listened to from your Last.fm profile, or a timeline of your Twitters. With a bit more Drupal and CSS knowledge, you can do all sorts of fancy styling of your streams, create tag clouds, or your own personal uberprofile. You can also sort, search, and filter on your data. There are even dedicated Drupal modules for things like Flickr galleries, del.icio.us bookmarking, and geotagging. You can see a very basic implementation of a custom lifestream application using Drupal here on my site here. Getting into the details of using Views or doing custom Drupal theming is beyond the scope of this post, but hopefully this gives you a bit of insight into another option for lifestreaming. 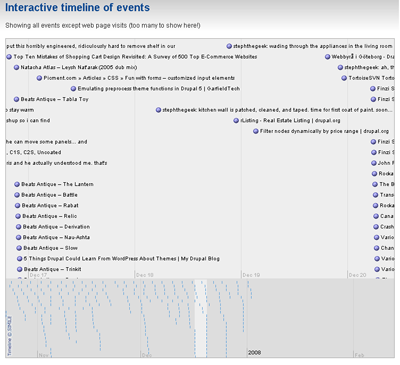 The timeline you see in the screenshot is from my lifestream, using a port of MIT’s Timeline viewer to a Drupal module. I’d highly recommend it for anyone looking for more of a DIY approach, especially if you’ve got a bit of tech knowledge. Drupal is definitely a great tool to use in building a lifestream. I mentioned this fact in a post I wrote last night. I wanted to point the readers of this post to my CCK and Views video tutorial which hopefully can take some of the guess work out of getting started with creating a lifestream using Drupal. You can find the flash video version and a downloadable version at http://learn.awakenedvoice.com/2007/07/30/drupal-cck-and-views-tutorial/. +1 for drupal as a perfect environment… I did it before ever reading about a lifestream 😉 way back in the time of aggregator2, before leech was created. I’m trying to build a life stream with Drupal right now. I just found out that it currently is running on PostgreSQL also; So there is nothing holding me back now. I hope I get the hand of working with Drupal soon. And perhaps you might see my new Drupal site live on my website. Thanks for the great hints on building this. I came across your site and this is very helpfull! Very Informative Article. Actually i don't have complete idea about Drupal. i got some idea on Drupal reading this blog. Nice sharing. Wonderful story on Drupal Development. Thans for helpful information. Nice written article on Drupal. Thanks for your information. Well Written Article on Drupal. Thanks sharing with this informative blog.